Supplied with the complete STOL CH 750 kit, the drawings are not just assembly instructions (as with most kits), but are detailed 11" x 17" CAD blueprints of the entire airframe assembly and parts, and come with a step-by-step assembly manual (on CD-ROM). Photo Assembly Guides for the step-by-step assembly of the kit. The affordable Drawings and Manuals may also be purchased separately. Supplied with a serial number, you can actually build your own aircraft from "scratch" following the Drawings and Manuals, or use them as a "study guide" prior to purchasing the kit. Scratch-builders can purchase any individual parts or components directly from Zenith Aircraft Company. If purchased separately, the cost of the drawings and manuals is deductible off the cost of the full kit. Also available is the complete Options Drawing Package, which includes the drawings (blueprints) for the popular kit options available for the STOL CH 750, including the the Folding Wings, Long Range Wing Tanks, Dual Control Sticks, Dual Brakes, Landing Light (LED), Micro VGs, Map Box for Panel, and Center Cabin Console. The option drawings package also includes engine mount blueprints for popular powerplant choices (in addition to the standard Continental O-200 mount), including the Jabiru 3300, Rotax 912S, Lycoming O-235 (dynafocal & conical). 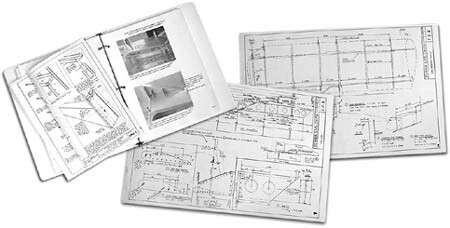 The option drawings package is only available as a supplement to the STOL CH 750 Drawings and Manuals package and is not available separately. Following are some selected sample drawings from the STOL CH 750 drawings. These are sample drawings only and are for informational and educational purposes only. Click here for information on purchasing the STOL CH 750 Drawings and Manuals. Independently produced by an experienced STOL builder, these videos (and more titles) from HomebuiltHELP.com are recommended time-savers to existing builders, and are an excellent resource to those considering to build their own airplane. HomebuiltHELP.com also offers other useful and informative titles.